A polypeptide hormone, secreted by β cells in the islets of Langerhans, which promotes glucose use, protein synthesis, and the formation and storage of neutral lipids; available in various preparations including genetically engineered human insulin, which is currently favored. Insulin is used parenterally in the treatment of diabetes mellitus. 1. a protein hormone formed from proinsulin in the beta cells of the pancreatic islets of Langerhans. The major fuel-regulating hormone, it is secreted into the blood in response to a rise in concentration of blood glucose or amino acids. Insulin promotes the storage of glucose and the uptake of amino acids, increases protein and lipid synthesis, and inhibits lipolysis and gluconeogenesis. Insulin. The precursor proinsulin is cleaved internally at two sides (arrows) to yield insulin and C peptide. 2. a preparation of insulin, either of porcine or bovine origin or a recombinant form with sequence the same as or similar to that in humans, used in the treatment of diabetes mellitus; classified as rapid-acting, intermediate-acting, or long-acting on the basis of speed of onset and duration of activity. 3. regular insulin; a rapid-acting, unmodified form of insulin prepared from crystalline bovine or porcine insulin. insulin aspart a rapid-acting analogue of human insulin created by recombinant DNA technology. buffered insulin human insulin human buffered with phosphate; used particularly in continuous infusion pumps. extended insulin zinc suspension a long-acting insulin consisting of porcine or human insulin in the form of large zinc-insulin crystals. insulin glargine an analogue of human insulin produced by recombinant DNA technology, having a slow, steady release over 24 hours. insulin human a protein corresponding to insulin elaborated in the human pancreas, derived from pork insulin by enzymatic action or produced synthetically by recombinant DNA techniques; sometimes used specifically to denote a rapid-acting regular insulin preparation of this protein. isophane insulin suspension an intermediate-acting insulin consisting of porcine or human insulin reacted with zinc chloride and protamine sulfate. Lente insulin insulin zinc suspension. insulin lispro a rapid-acting analogue of human insulin synthesized by means of recombinant DNA technology. NPH insulin isophane i. suspension. prompt insulin zinc suspension a rapid-acting insulin consisting of porcine insulin with zinc chloride added to produce a suspension of amorphous insulin. Semilente insulin prompt insulin zinc suspension. Ultralente insulin extended insulin zinc suspension. insulin zinc suspension an intermediate-acting insulin consisting of porcine or human insulin with a zinc salt added such that the solid phase of the suspension contains a 7:3 ratio of crystalline to amorphous insulin. 1. A polypeptide hormone that is secreted by the beta cells of the islets of Langerhans in the pancreas and functions in the regulation of carbohydrate and fat metabolism, especially the conversion of glucose to glycogen, which lowers the blood glucose level. It consists of two linked polypeptide chains called A and B. 2. Any of various pharmaceutical preparations containing this hormone or a close chemical analog, derived from the pancreas of certain animals or produced through genetic engineering and used in the medical treatment and management of type 1 and type 2 diabetes. 1 a naturally occurring polypeptide hormone secreted by the beta cells of the islets of Langerhans in the pancreas in response to increased levels of glucose in the blood as well as to the parasympathetic nervous system and other stimuli. The hormone acts to regulate the metabolism of glucose and the processes necessary for the intermediary metabolism of fats, carbohydrates, and proteins. Insulin lowers the blood glucose level and promotes transport of glucose into the muscle cells and other tissues. Inadequate secretion of insulin causes elevated blood glucose and triglyceride levels and ketonemia, as well as the characteristic signs of diabetes mellitus, including increased desire to eat, excessive thirst, increased urination, and eventually lethargy and weight loss. Uncorrected severe deficiency of insulin is incompatible with life. Normal findings of insulin assay in adults are levels of 5 to 24 mmU/mL. 2 a pharmacological preparation of the hormone administered in treating diabetes mellitus. The various preparations of insulin available for prescription vary in onset, intensity, and duration of action. Animal source insulins, pork and beef, have been discontinued in the U.S. market. Human insulin is derived by recombinant DNA technology and is termed quick acting, intermediate acting, or long acting. Most replacement insulin is given by subcutaneous injection in individualized dosage schedules and insulin pumps, but insulin also can be replaced intravenously. Adverse reactions include hypoglycemia and insulin shock that result from excess dosage and hyperglycemia and diabetic ketoacidosis from inadequate dosage. Fever, stress, infection, pregnancy, surgery, and hyperthyroidism may significantly increase insulin requirements; liver disease, hypothyroidism, vomiting, and renal disease may decrease them. Blood tests for glucose and ketones are performed to determine the need for adjustment of the dosage or of the schedule of administration. See also human insulin. Physiology A disulfide-linked polypeptide hormone produced by the beta cells of the pancreatic islets, which controls serum glucose and anabolism of carbohydrates, fat, protein. See Biphasic insulin, PEPCK, Proinsulin, rDNA insulin. A polypeptide hormone, secreted by beta cells in the islets of Langerhans, which promotes glucose use, protein synthesis, and the formation and storage of neutral lipids; available in a variety of preparations including genetically engineered human insulin, which is currently favored, insulin is used parenterally in the treatment of diabetes mellitus. In the past, insulin for injection was obtained from beef or swine pancreas. These peptides differed from human insulin by a few amino acids, causing some immune reactions and drug resistance. Most insulin now in use is made by recombinant DNA technology and from an immunological perspective is equivalent to human insulin. 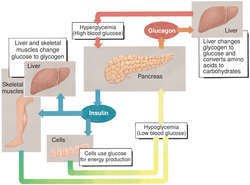 In health, the pancreas secretes insulin in response to elevations of blood glucose, such as occur after meals. It stimulates cells, esp. in muscular tissue, to take up sugar from the bloodstream. It also facilitates the storage of excess glucose as glycogen in the liver and prevents the breakdown of stored fats. In type 1 diabetes mellitus, failure of the beta cells to produce insulin results in hyperglycemia and ketoacidosis. The insulin dosage should always be expressed in units. There is no average dose of insulin for diabetics; each patient must be assessed and treated individually Doses are titrated gradually to achieve near normal glucose levels, about 90–125 mg/dl. The FDA requires that all preparations of insulin contain instructions to keep in a cold place and to avoid freezing. Those who use insulin should wear an easily seen bracelet or necklace stating that they have diabetes and use the drug. This helps to ensure that patients with hypoglycemic reactions will be diagnosed and treated promptly. A rapidly acting insulin administered subcutaneously, with action similar to that of insulin lispro. Aspartic acid replaces proline at a crucial position in the insulin molecule. An insulin preparation that includes two components, typically a rapidly acting insulin, e.g., regular insulin, and an insulin that has a longer duration of action, e.g., NPH insulin. A form of insulin that provides basal insulin coverage throughout the day, with little variation in drug levels. It is typically administered as a single injection (often at bedtime) and is usually part of a regimen that includes multiple injections of short-acting insulins or multiple doses of metformin at meal time. It is made by changing the glycine and arginine content of the insulin polypeptide. Insulin given by inspiration, with the use of an inhaler. It may be composed of liquid droplets or a dry powder. One inhaled insulin product was removed from use in 2008 because of its adverse effects on the lungs. 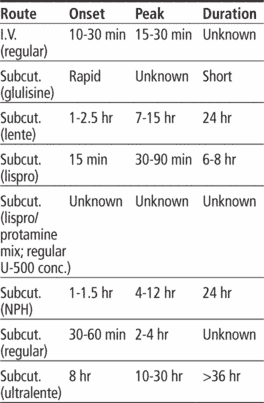 Intermediate-acting insulin with onset in 1 2 to 1 hr and a duration of 18 to 28 hr. A synthetic insulin with a very rapid onset and short duration of action. Diabetic patients typically use it immediately before meals to prevent postprandial hyperglycemia. Its absorption is more rapid than regular insulin. It is made by reversing the amino acids lysine and proline in the beta chain of the insulin polypeptide (hence its name lispro). Long-acting insulin with onset in 6 to 8 hr and a duration of 30 to 36 hr. Insulin made by the use of recombinant DNA technology. Long-acting insulin with onset in 5 to 8 hr and duration of more than 36 hr. Fast-acting insulin with onset less than 1 hr and a duration of 12 to 16 hr. A peptide hormone produced in the beta cells of the Islets of Langerhans in the PANCREAS. 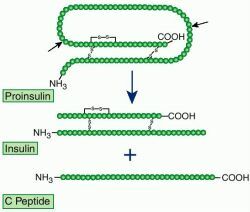 Insulin facilitates and accelerates the movement of glucose and amino acids across cell membranes. It also controls the activity of certain enzymes within the cells concerned with carbohydrate, fat and protein metabolism. Insulin production is regulated by constant monitoring of the blood glucose levels by the beta cells. Deficiency of insulin causes DIABETES. Insulin preparations may be in the ‘soluble’ form for immediate action or in a ‘retard’ form for prolonged action or as mixtures of these. Most insulins for medical use are now produced by recombinant DNA methods (genetic engineering) and are identical to human insulin. Bovine and porcine insulins are still used. Brand names include: Neutral Insulin injections: Humalog, Actrapid, Velosulin, Humulin S, Hypurin Bovine Neutral, Hypurin Porcine Neutral, Insuman Rapid, NovoRapid and Pork Actrapid. Biphasic Insulin injections: Humalog Mix25 and Mix50, Mixtard, Humulin, Hypurin Porcine, Insuman Comb, NovoMix 30 and Pork Mixtard 30. Isophane Insulin injections: Insulatard, Humulin, Hypurin Bovine Isophane, Isuman Basal and Pork Insulatard. Insulin Zinc Suspension (Mixed): Monotard, Humulin Lente and Hypurin Bovine Lente. Insulin Zinc Suspension (Crystalline): Ultratard and Humulin Zn. Protamine Zinc Insulin injection: Hypurin Bovine PZI. Long-acting Insulin Analogue: Lantus. The prefix ‘Human’ was deleted from insulin products in mid-2003. it promotes GLYCOLYSIS of glucose in all cells. Underproduction of insulin causes diabetes mellitus , resulting in an increase in blood sugar (hyperglycaemia) and sugar appearing in the urine (see GLYCOSURIA). 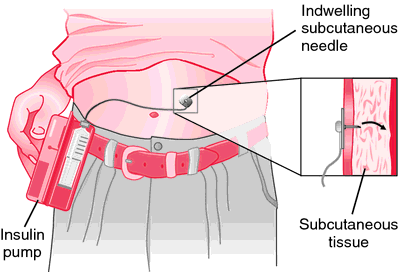 The condition can be fatal if untreated, treatment being by injection of insulin into the blood stream. The hormone cannot be taken orally as, being a protein, it would be digested. Insulin was discovered by BANTING and BEST in 1921. The control of blood sugar, where a change in its level automatically brings about the opposite effect, is a good example of a negative FEEDBACK MECHANISM. A hormone secreted by the pancreas in response to high blood sugar levels that induces hypoglycemia. Insulin regulates the body's use of glucose and the levels of glucose in the blood by acting to open the cells so that they can intake glucose. a polypeptide hormone produced by the beta cells of the islets of Langerhans in the pancreas, associated mainly with regulation of blood glucose, in which it exerts an opposite effect to that of glucagon. Involved also in distribution, utilization and storage of protein and fat, as well as of carbohydrate, and in interconversion among them. 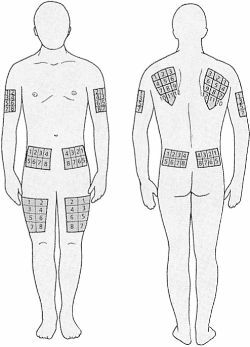 Insulin secretion is stimulated by a rising blood glucose concentration and by the parasympathetic nervous system. It lowers blood glucose by promoting its transport into cells (notably muscle and fat cells) and diminishing its output from the liver, and it promotes formation of glycogen in liver and muscle. An absolute or relative lack of insulin results in hyperglycaemia (high blood glucose) and presence of glucose in the urine (glycosuria), along with decreased utilization of carbohydrate and increased breakdown of fat and protein: the condition of diabetes mellitus. Sporting activity by diabetics tends to reduce blood glucose, so good diabetic control with frequent blood sugar testing and adjustment of insulin dosage is important. See also diabetes. n hormone produced by the pancreas that regulates blood glucose levels by stimulating the absorption of sugars into the cells. Polypeptide hormone, secreted by β cells in islets of Langerhans, which promotes glucose use, protein synthesis, and formation and storage of neutral lipids; available in various preparations including genetically engineered human insulin, which is currently favored; used parenterally to treat diabetes mellitus. n a hormone produced by the beta cells of the islets of Langerhans in the pancreas. It promotes a decrease in blood sugar. Its action may be influenced by the pituitary growth hormone, adrenocorticotropic hormone; hormones of the adrenal cortex; epinephrine; glucagon; and thyroid hormone. uses: ketoacidosis; type 1 and type 2 diabetes mellitus; hyperkalemia; hyperalimentation. n a type that comes from a source external to a diabetic patient's body, taken to offset the patient's natural deficiency of insulin. n a type that is a medium between rapid-acting and long-acting insulins; the onset is not as fast as rapid-acting insulin, but it reaches its peak action over a 4- to 12-hour period. n.pr an intermediate-acting type that reaches its peak action over a 4- to 12-hour period. n.pr a rapid-acting type that reaches its peak action in 30 to 90 minutes. n a type that has a slow onset but reaches its peak action from 12 to 16 hours after administration. n a synthetic type used to treat diabetes. Classified as intermediate acting; peak action occurs 4 to 10 hours after administering. n a synthetic type of insulin used to treat diabetes. Reaches peak action 30 to 90 minutes after administering. n a synthetic type used to treat diabetes. Classified as short acting; peak action occurs 2 to 3 hours after administering. n a complication of diabetes mellitus characterized by a need for more than 200 units of insulin per day to control hyperglycemia and ketosis. The cause is associated with insulin binding by high levels of antibody. n a synthetic type used to treat diabetes. Classified as long acting, with peak action occurring 12 to 16 hours after administering. a double-chain peptide hormone formed from proinsulin in the beta cells of the pancreatic islets of Langerhans. Insulin promotes the storage of glucose and the uptake of amino acids, increases protein and lipid synthesis, and inhibits lipolysis and gluconeogenesis. The secretion of endogenous insulin is a response of the beta cells to a stimulus. The primary stimulus is glucose; others are amino acids, particularly leucine, and the 'gut hormones', such as secretin, pancreozymin and gastrin. These chemicals play an important role in maintaining normal blood glucose levels by triggering the release of insulin after ingestion of a meal. Commercially prepared insulin is available in various types, which differ in the speed with which they act and in the duration of their effectiveness. There are three main groups: rapid acting (regular or semilente), intermediate acting (isophane suspension or NPH, zinc suspension or lente), and long acting (protamine zinc suspension or PZI, or ultralente). Mixtures are also marketed. a combination used in emergencies to lower blood potassium levels in acute hypoadrenocorticism. ratio of insulin to glucagon; thought to determine the predominance of the action of one hormone over the other. radioimmunoassay methods are used in determining blood levels of insulin. Increased levels are found with hypoglycemia caused by functional islet cell tumors. a device consisting of a syringe filled with a predetermined amount of short-acting insulin, a plastic cannula and a needle, and a pump that periodically delivers the desired amount of insulin. Sometimes used in humans, but of limited application in animals. used to differentiate diabetes mellitus from pituitary and adrenal diabetes. A test dose of exogenous insulin will produce a rapid and marked decrease in blood glucose if the pancreas is not secreting sufficient insulin. A much less dramatic response is produced if hyperglycemia is due to excessive secretion of either pituitary or adrenocortical hormones rather than insufficient insulin production. disposable syringe with a capacity of 1 ml or less and a fine gauge needle (27-29G) attached, and graduation markings corresponding to insulin units in standard preparations. Needles may also be treated to minimize pain on injection. Q. what does an insulin shot do? and what is it good for? A. Insulin is a hormone (substance that controls the activity of the body) that enables muscles and fat to use the glucose (sugar) we get from the diet as a source of energy for activity or for storage as fat. Thus, it lowers the concentration of glucose in the blood. It's produced and secreted from the pancreas, a gland located in the back of the abdomen. When people don't have insulin, or if the body doesn't respond to insulin (essentially diabetes mellitus type 1 and 2, respectively), therapy with insulin helps the body maintain a normal level of glucose. Excessive concentration of glucose in the blood is termed "hyperglycemia" and is deleterious in the long term. Q. Why is insulin injected and not taken as a pill? A. so if that's the case, why can't you use a patch (like a nicotine patch)? wouldn't that do the same trick? Q. is there an alternative for the Insulin shots? something less painful but yet effective as the old way? A. Here is a good site on alternative insulin delivery: http://www.diabetes.org/for-parents-and-kids/diabetes-care/alternative-insulin.jsp Hope this helps.